Home » Fashion » Bags » Faking it till you make it? Don’t do it! Faking it till you make it? Don’t do it! This is a controversial issue, but what is your take on fake bags? My place of work is near Petaling Street, which is a haven for fake merchandise, ranging from bags to T-shirts and watches. I am usually assaulted by the many new designs of fake luxury bags available there, some of which donâ€™t even exist in the arsenal of the designer houses.Its impressive what these pirates can come up with. I’m going to just talk about bags because I love bags and at one time, used to buy lots of it from all ranges. I’ve since scaled back, as my wallet thanks me every day. My take on buying fake bags is, Don’t Do It. If you buy a fake bag because you want to own the brand but cannot afford it, then in my view, you’d be better off not buying the fake at all. You aren’t doing the brand a favour, and you won’t appreciate it even after you buy it, because you know its fake. Your friends or family may not know it, but you will. There will be situations when you feel awkward, if in the company of people who carry the real stuff. And you won’t treasure it, which is a pity for a good bag ought to be treasured. You’d really be better off putting that money spent on the fake towards a little saving fund for the real thing. Its not that hard to save for it, if you really want to. Also, wait for sale periods. When buying expensive items, even 20-30% off is a lot saved! If you buy a fake bag because you like the design, then you could just find a similar design in a cheaper brand. Many brands, both local and foreign, make knock-offs of designer bags. So if you like a particular design, try looking in a brand you can afford. If it’s a classic design you are eyeing, then its worth saving up for. If its just a trendy design that could go out of fashion quickly, look for alternatives. This is my take on this issue. I’ve been there and done that, and I’ve found that I have greater appreciation for and value the items I have saved up for. Also, the period it takes me to save up for the item helps me decide if I really still want it. If I still want it by the time my savings hit their target, then I’ll get it. If by the time I hit my target I don’t find myself thinking of it anymore, great! Money saved! But if you must buy a fake, then make sure you get your money’s worth. A good fake doesn’t come cheap. Expect to pay a couple of hundred ringgit for a A-rated copy. Some of these copies are so good, its hard to tell it from the real thing. But the price you pay is also very good. As I said, this money could be put towards a bag fund for the real thing. 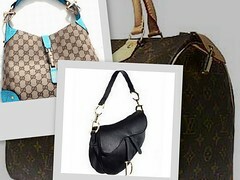 If you plan to get a fake again, try to go for a brand other than a Louis Vuitton monogram. The pale leather on a monogram Louis Vuitton is a dead giveaway as to whether you are carrying a real or fake bag. So, go for logos in other brands, or maybe on canvas, that isn’t so obvious or easy to tell. If you plan to get a PVC copy of a leather bag, again its obvious. So really, a canvas bag is the best bet. If you only plan to pay less than RM100 for a fake, then you’ll only be getting a copy that could obviously stand out as a fake. You’ll notice fraying ends, loose threads, odd looking designs – in other words, not worth your money faking it. Tine: teehee yeah, sometimes you just have to act the part 😛 But I’m more forgiving towards wallets for some reason. I guess its because they don’t last as long anyway. But bags are so in your face and coming from someone who loves bags, it pains me to see bad fakes. Agree with you – if can’t afford it, buy cheaper brands. S-kay: If you take care of it and get a good believable fake then I guess its not as bad heh. Yeah.. I agreed with the writer. Save and then buy the Authentic piece. But.. as for me, usually after saving soo much, I feel pity to let my money go juz for the design that I like. Hey, it’s really painful to pay USD1970 for 1 bag for the sake of fashion. As we all know that fashions are not permanent. It will wear off as time passed by. I think I dun mind buying fake. A GOOD fake bag. At the end of the day, i dun feel tat bad leaving my bag in the living rooms when I reached home while my cat starts jumping over it. Hahaha.. Couldn’t imagine if that bag costed me a BOMB!! Whatever it it.. everyone has their own choice and the money is yours. It’s either you buy the fake or original bag, as long as u are happy with it. Then, it’s fine. Go for it.